Keep the lunchbox routine fresh with delicious ideas. 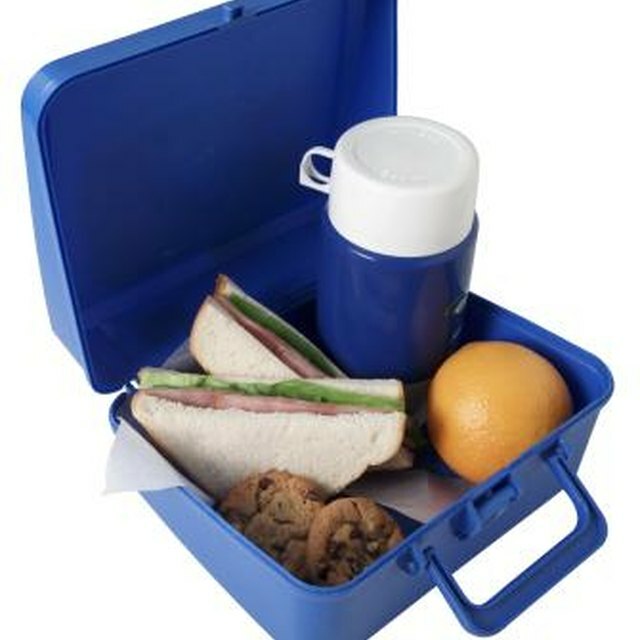 When the kids tote a lunch box to school every day, lunches can become tedious and boring if you don't take the time to keep them interesting. Use a little imagination and just a bit of effort to pack nutritious and enjoyable lunches. Keep the fresh and easy lunch box ideas coming so your kids enjoy their lunches. Pack cottage cheese and fruit salad or yogurt with fresh fruit. Instead of a basic sandwich between two slices of bread, use a tortilla and make a wrap instead or use pita bread. Tuck chicken or tuna salad, sliced roast chicken and a couple of slices of cheese, or sprouts, tomatoes and creamy salad dressing inside for a new spin on the standard sandwich. Another option is to use wafer-thin crackers and top them with cream cheese or peanut butter for a nutritious and crunchy sandwich. Use a thermos to expand the lunch options. Make homemade macaroni and cheese and spoon it into a single-serving thermos. Even leftover spaghetti, chili or soup could make delicious lunch entrees -- don't forget the crackers for chili or soup. A lunchbox-sized thermos could be the ideal size for holding one or two warm turkey hotdogs. When lunchtime comes, your child can place a warm hotdog onto a hotdog bun, add some condiments and enjoy a special lunch. Tuck dried fruit into the lunch box for a delicious and nutritious treat. Slather cream cheese or peanut butter onto celery sticks to make sure your child gets his protein and vegetables. Include string cheese or cheese curds or even a hardboiled egg. If your child likes dipping, add an assortment of raw veggies and some ranch dressing or apple wedges and yogurt for dipping. When you pack your child's lunch, you have an ideal opportunity to add a special touch that will remind your child how much you love her. Write a little note -- just a few words -- and sign it "love Mom." The note of communication will help connect you and your child even when you are apart all day.